Would you just look at these awesome cards!!! I'm obsessed. Completely. I was making them last night and I kept stopping to hold up my work, show it to Chris and proclaim: "Isn't this just the best thing ever!!??" He got tired of the excitement pretty quick, but I'm still not over it. This adventure started a long, long time ago when I pinned this picture. 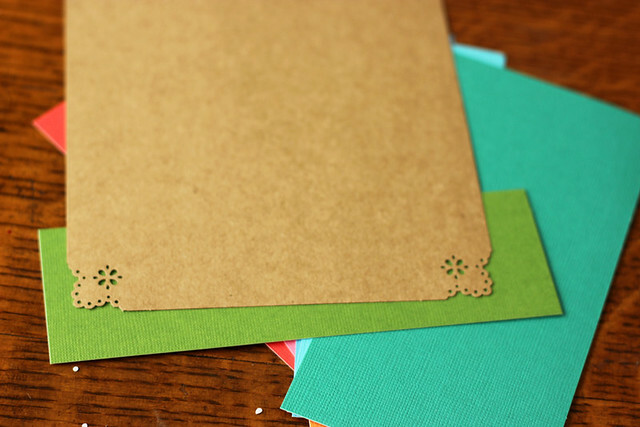 The world of fancy paper cutting was completely foreign to me, I didn't even know it was an option. Until yesterday the fanciest cutting I had ever done was when I made my wedding invitations and used (and broke) a pair of scalloped edged craft scissors. Then, a few months ago, Michaels came to Quebec and my eyes have been opened to an overwhelming world of crafting options. Mom and I had a project to do that would be vastly improved if we added a fancy cut edging to it (more details on that project soon... hint: it may have involved making invitations to a certain someone's baby shower!) 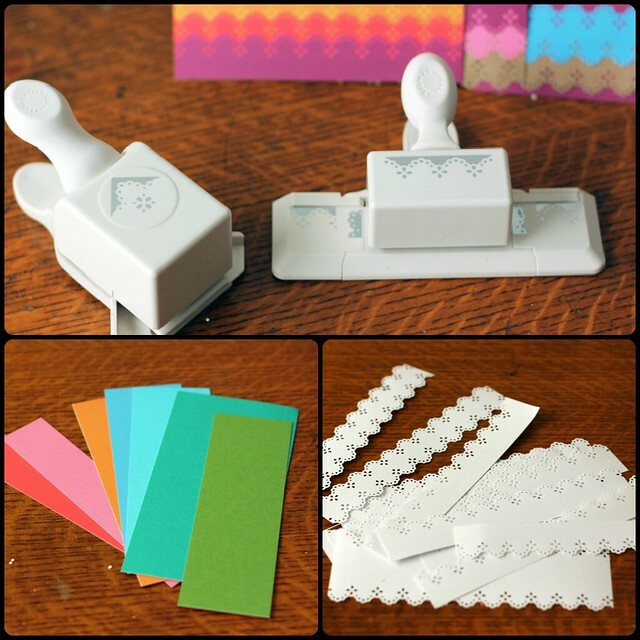 We picked up this "eyelet lace punch around the page" set from Martha Stewart Crafts. 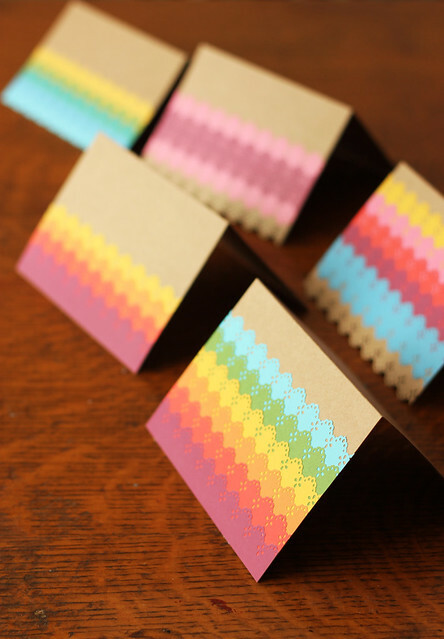 I also picked up a bunch of blank cards and a pack of multicoloured sticker paper (not for the shower invitation project, just for my own fun). 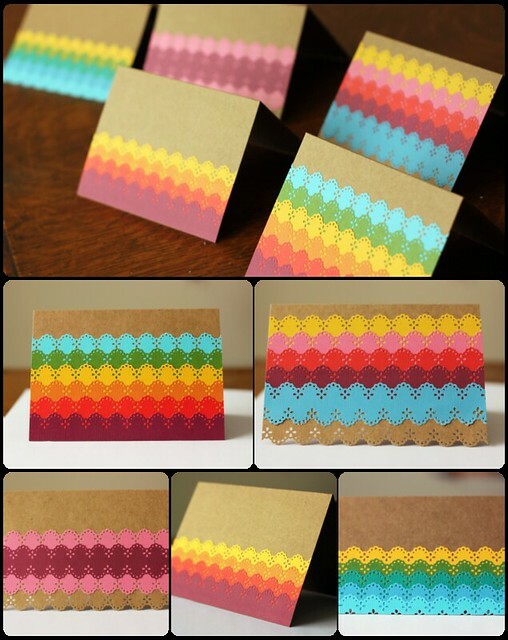 Using the punch I cut out strips of colourful lacy paper, peeled off the backing and stuck them onto my cards. Voila!!! The results are so high impact and, in case you couldn't tell, make me very VERY happy. A wee sweater in progress, this one is a gift, it's now finished and is super cute! Can you spot the new colourway? I've been getting a lot of inquiries lately from people who want to know what my plan is. How do I intend to keep TFA afloat, all by myself, while taking care of a newborn? Good question! The answer is quite simple, basically, I'm not all by myself. I've got Chris to do all the dyeing and my mom to help out with everything else. And I can't exclude my dad, he rarely gets a mention on the blog, but he's basically the baby whisperer (not joking, he's really got a golden touch with babies, he loves them and they really love him) so I'll be inviting him over a lot! All of us will be taking time off when the baby is born. I'll still be checking e-mails (though I may take a day or two longer to answer them) and I'm sure I'll pop in with a few blog posts to introduce you all to our newest member of team TFA, but once we've taken a week or so to settle in at home, Chris will be back to work dyeing up yarn for all your orders and mom will be helping me take care of the rest. So for the most part, other than having a new face on the blog to coo over, you really shouldn't notice much of a difference from TFA. I feel extremely lucky to have such a strong support system in place. Most new moms are left alone at home a week after the baby is born when their husbands have to go back to work. Maybe their mom will come stay for a week or two to pitch in, but not everyone gets a husband who works from home and a mom who lives 10 minutes away. When Chris goes back to work he'll walk across the backyard and be a quick shout away should I need him. Chris and I have always known that we wanted a family. In fact, back in 2008 when I officially started TFA, part of my reason for doing so was because I knew that the late night, long hours of the restaurant business were not what I wanted to be doing long term. Along the way we have always kept our future family in mind when making decisions about the growth and management of TFA. That's why we opted to build a backyard studio rather than rent a space, why we've made the decision to stay small and flexible rather than go big. It has always been our plan that our lives at TFA would be able to pretty seamlessly be integrated with our lives as parents. We started scaling back on some of our production earlier this year, just to make this transition more manageable for us, and if you haven't noticed a change yet, you likely won't. We'll be amping up our inventory before the baby comes. Our focus is on our direct to customer retail sales, including our website sales, Etsy shop sales and Club memberships. The website will not shut down, there will hopefully still be a few One Of A Kind Etsy updates and of course the Club will go on as usual. You may find it a little bit harder to find my yarns at your LYS (though lots of my LYS's have been stocking up on inventory, so maybe you'll find it easier than ever!) but everything will still be available on my website as usual. 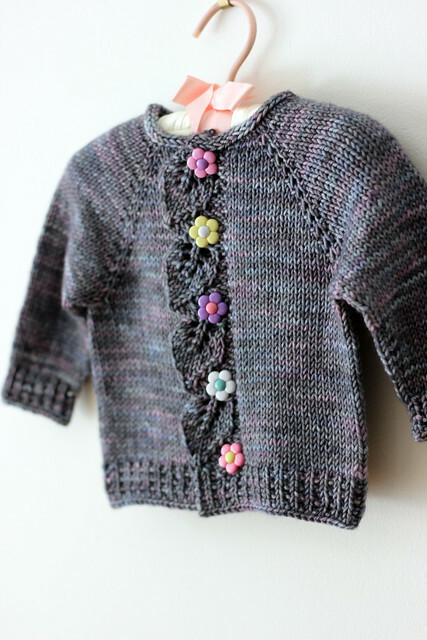 The one thing that I haven't been able to fit in with the new baby this year is the DKC Knitter's Frolic. The baby is due early April, who knows when I'll actually go into labour, and committing to the April 27th Frolic date is just not realistic. I'm sad to miss it, but I think that trying to make it work would just make me crazy and stressed. I plan on being back next year with baby in tow! I'm feeling extremely creative lately, I've got no less than 5 or 6 patterns in development at the moment, all of which I'm very excited about. 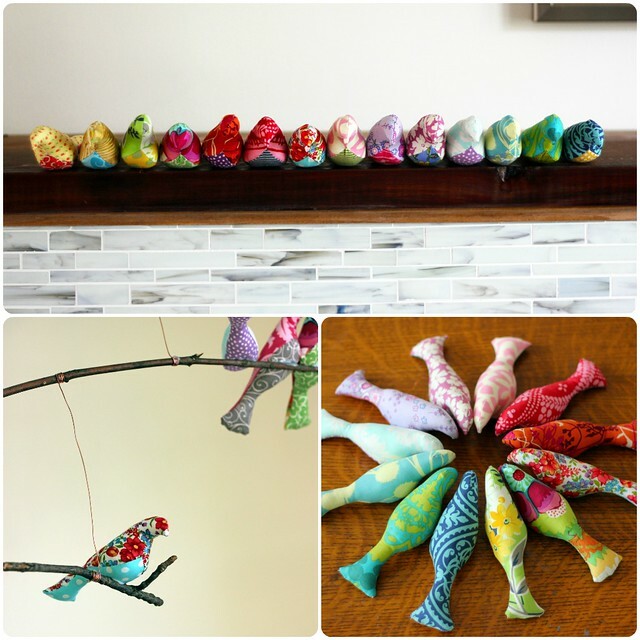 We're working on new colours, considering new yarn bases, things at TFA have never been more rewarding! So have no fear, TFA is growing and changing, but from where I'm sitting, it looks like things are just getting better. The first Year In Colour Club shipment of 2013 has been sent out and I think that I can confidently say that it's been well received! I had figured that most would be pretty excited about receiving a yummy skein of luxurious Silver Label 100% mulberry silk yarn... and paired with Julie's stunning pattern, I'd say it was a home run! 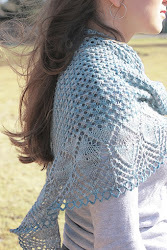 The Aerie Scarf by Julie Crawford is a beautiful, feminine, lacy scarf that makes the most of one special skein of silk. 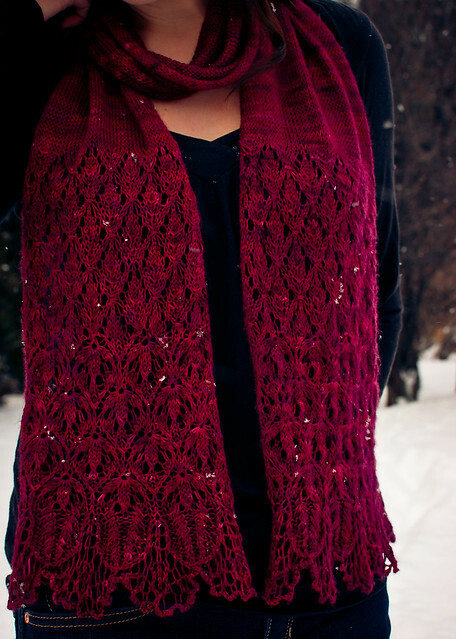 The lace patterns focused on the ends of the piece keep the knitting interesting, and the stockinette section in the middle makes for a really cozy fabric to wrap around your neck while giving you a little break from having to focus on charts! 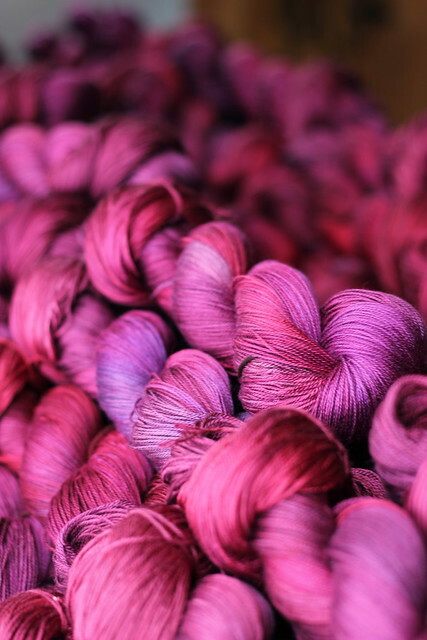 This months Boysenberry colourway is a really pretty mix of pink, red, burgundy and purple. Just the thing to brighten up your day this frigid January! It's never too late to join the Club! 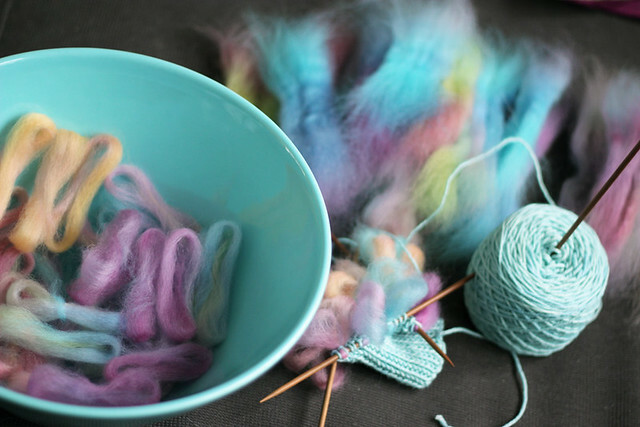 Sign up today and receive your January yarn along with the next Club shipment in March! 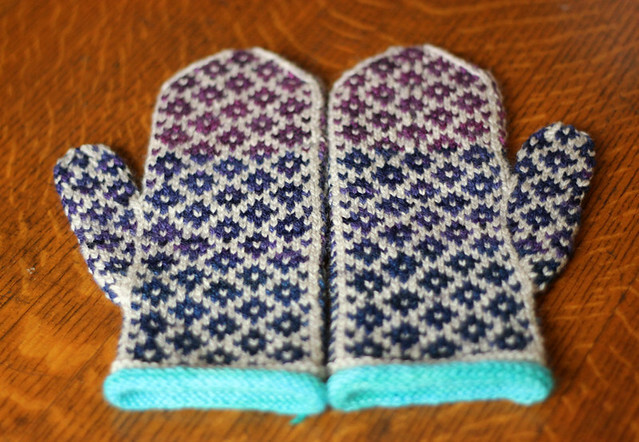 My awesome, multicoloured, fairy inspired thrummed mittens are finished. They are so much fun! 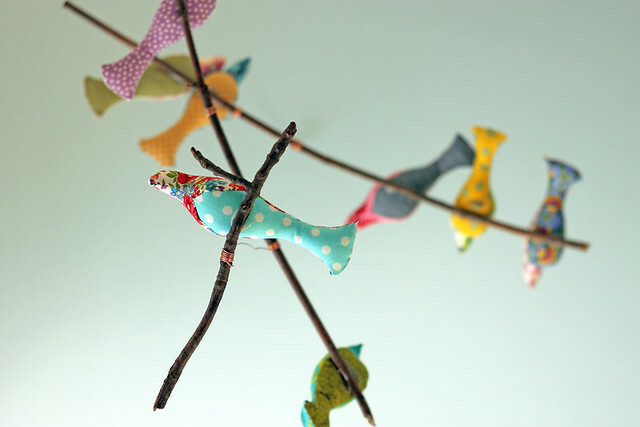 They're fun to make, fun to wear and especially fun to turn inside out and look at. There's something really silly about thrummed mitts that makes me love them even more. 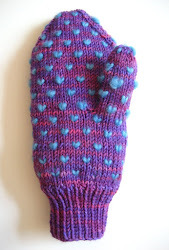 Just look at that mitten turned inside out. It's like a firework! A party! yes! There is lots of talk about how much knitting time one loses when she welcomes a baby into her life. I'm trying to prepare myself for that reality, but it's a tough pill to swallow. What I didn't realize was how much doctor's-office-waiting-room-knitting-time would be thrown my way during this pregnancy. My once monthly appointments, mingled in with occasional ultrasounds and blood tests have now been bumped up to once ever 2 weeks and soon will go to weekly. This all adds up to hours of time spent sitting in waiting rooms. Fine by me! I've got my knitting. I look around and see all the other people reading gossip magazines or playing games on their phones and think how much happier everyone would be if they were just knitting. It makes the time spent waiting feel like time spent being productive. 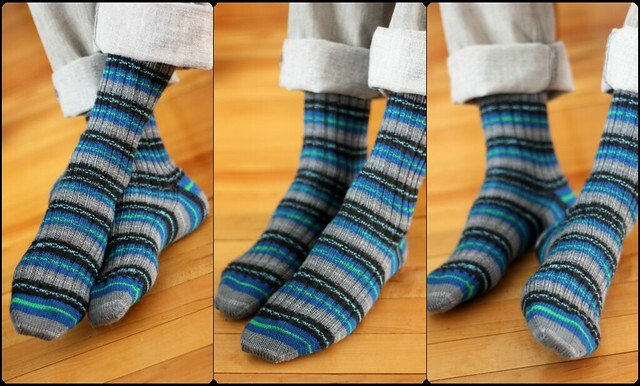 These socks were knit over the last few months, most of the knitting was done in waiting rooms, and that's totally ok with that. 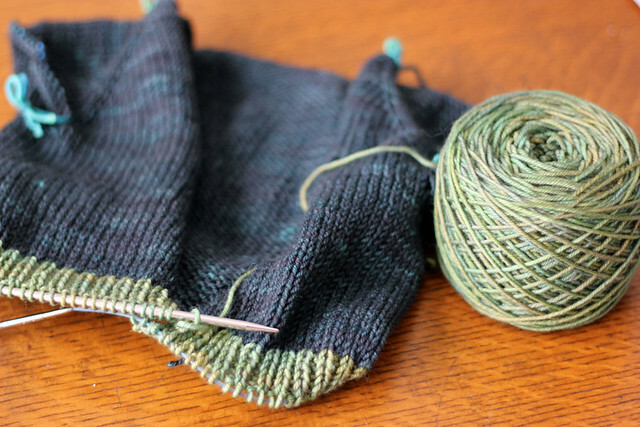 This weekend when I found myself needing a new project to work on, I decided to cast on for a pair of thrummed mitts. 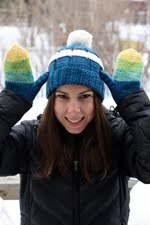 I am totally on board the thrummed mitten crazy train. These babies are so fun! I was working away, preparing my thrums as I went when Chris walked in and spotted my set up on the sofa. He mumbled something about me looking like a fairy in a rainbow cloud workshop... or something along those lines. I love it, I think that description sums up the situation quite nicely! Last night the strangest thing happened. I'm usually a very good sleeper (something I'm very grateful for) but last night I woke up at 1:45 am and stayed wide away until 5 am. I have no idea why. My eyes were open and I couldn't seem to close them. Then one thing led to another and my brain started working and the wheels started turning and I just couldn't shut down. I started thinking, worrying, fretting. Not about anything in particular or anything very worrisome. Then I got the best little wake up call, the baby got the hiccups! It was the most adorable thing ever and I just lay there with my hand on my belly for what felt like forever as my little babe bounced up and down to a quick little hiccup rhythm. I can't believe it, there is a real human person in there who gets the hiccups. What a thrill. I'm in my third trimester now, I still feel great and have a surprising amount of energy. My belly is getting rounder by the day and I'm loving every second that I spend admiring my ever changing profile in the mirror. My only complaint is that it's going by too fast. A few months ago when we found out we were expecting all I wanted was for these 9 months to rush by as quickly as possible so I could get to the end of the journey and come out the other side with my fresh little miracle. But now that it's actually happening I'm getting anxious about always looking forward and not taking the time to appreciate what's happening right now. Though I am super excited to meet my little boy or girl (and to stop calling my baby "the baby") my aim is to spend these next couple of months living in the moment and appreciating every little hiccup that baby offers me while he/she is still safe in my belly. Ok gang, I think that this is officially the last FO I'll post from 2012, then we should be all up to speed and I can enter 2013 with the rest of the world! Voila, Cascade by Raya Budrevich, knit in TFA Green Label Aran Weight yarn in the Dove colourway. This colourway is a perpetual favourite of mine and I really love it for this adorable pattern. 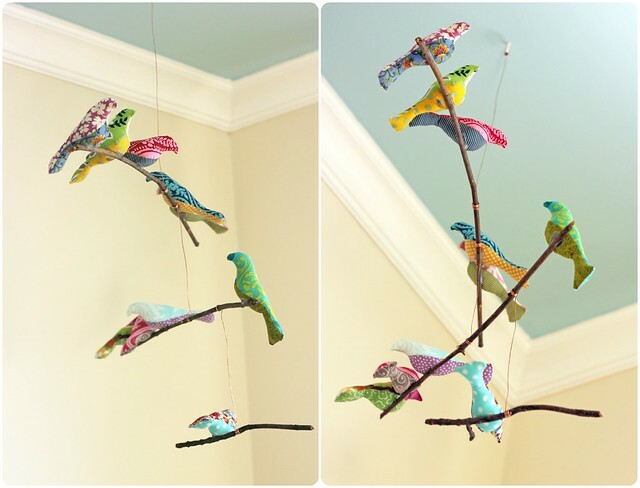 The pattern is girly enough, the grey colour with shades of lavender and pink shining through adds a nice subtle touch. I think that the Green Label is probably the absolutely perfect base yarn for this pattern. The stitch definition is so crisp so those petals really pop out. 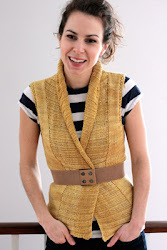 I made a few mods to this pattern which I've done my best to detail on my Ravelry project page here. The original pattern is great, but in my opinion these simple mods take it over the top to perfect! Even though we don’t know wether we’re expecting a little girl or a little boy, I let myself indulge in this super sweet girly pattern to put in my “just in case it’s a girl” pile of knits. I’ve opted to make a larger size so if we don’t have a girl it will be the right size to gift to my niece Annika for her birthday! Win-win. I knit this sweater in one weekend, gotta love teeny, tiny aran weight knits. 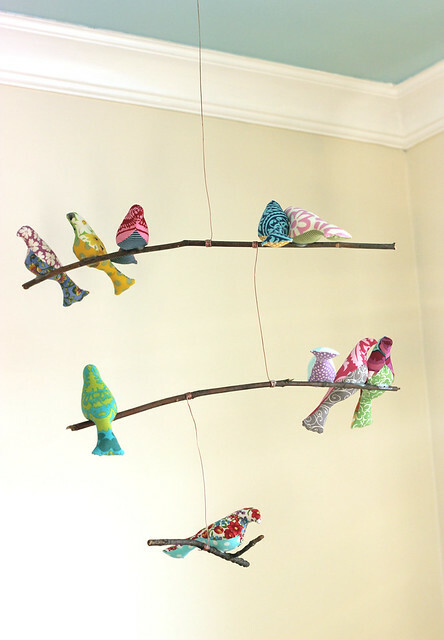 They just fly off the needles. I've had these buttons for a little while now, I picked them up thinking that they were sweet and would work well on a baby girl knit one day. 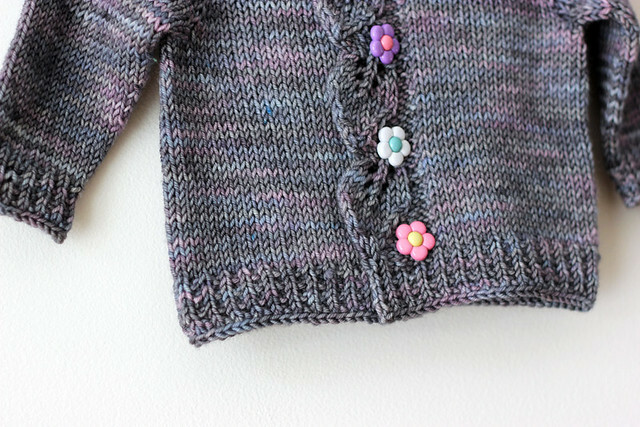 I'm really pleased with how nicely they flow with the petals down the front of this cardigan. It seems as though every baby knit I make immediately becomes my new favourite, this one is no exception, it makes me giddy for all it's cuteness! 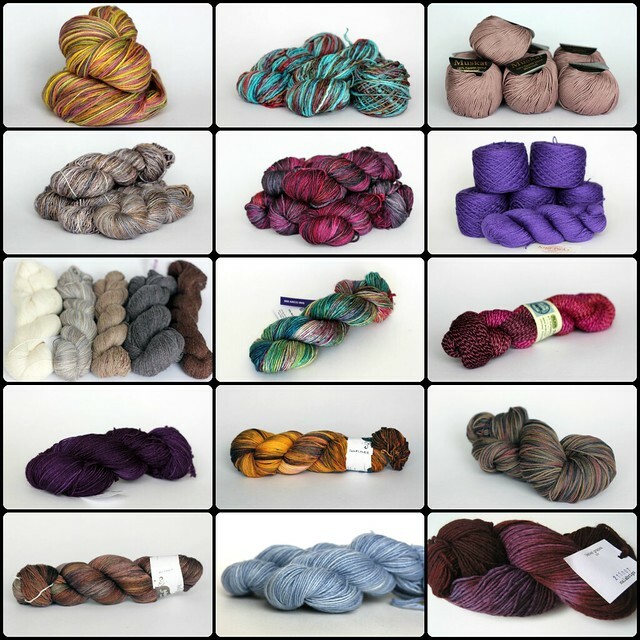 All of these yarns are currently available for sale. Details for each can be found on my Ravelry stash page under the "will trade/sell" header here. If you're interested, have any questions or just want to make me an offer, feel free to send me a Ravelry message or an e-mail! There's some really good stuff up there, a bunch of Malabrigo, some Hedgehog Fibres, Dream in Colour. These yarns deserve a good home! First things first... today is Chris' birthday!!! Yay! Happy birthday to the love of my life, TFA wouldn't work without you babe. 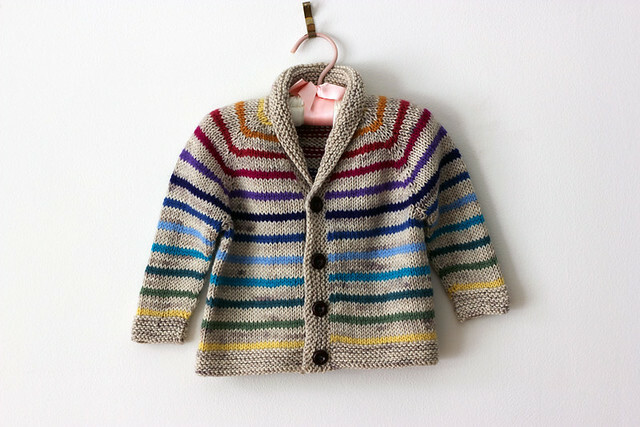 Another baby sweater. I kinda got the baby sweater flu big time back in December and it took 3 fresh baby knits for me to shake it. I'm not fully convinced that I'll ever really get baby knits out of my system, but for now I've gotten to a place where I can at least sleep at night without waking up feeling the need to cast on for something wee and adorable. 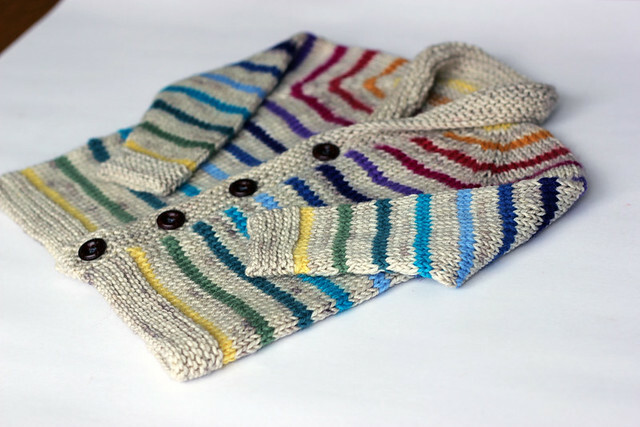 This sweater is a hybrid of the Gramps pattern (for the construction and proportions) but inspired by the Baby Sophisticate pattern (for the garter stitch edgings). 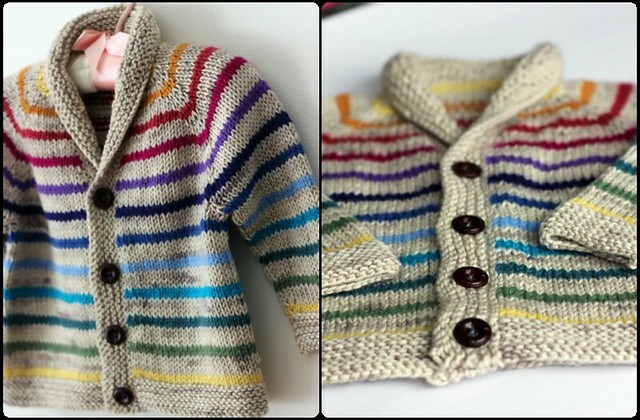 Add to that a dash of rainbow stripes and this little cardigan is perfect. Following the instructions for the Gramps I knit a size 6-12 months, but I think that this sweater turned out kinda huge. I know a few 2-3 year olds who it would fit quite well. The sizing doesn't bother me at all though, I mean really, how big is a 6-12 month old anyway? It'll fit the baby eventually, that's all that matters to me. 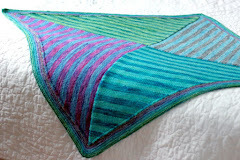 I knit this sweater using Green Label Sand as the main colour and leftovers from my Mitered Square Blanket for the stripes. I love it. The stripes turned out exactly how I wanted them to. 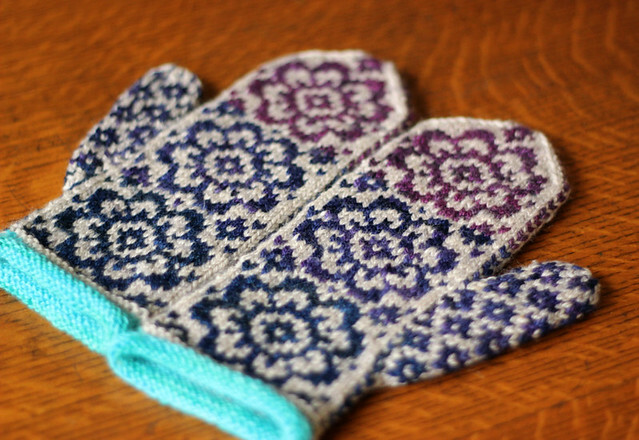 I knit these beautiful mittens for my sister Lilia for Christmas this year. I've had this pattern for years and am so glad that I finally got around to knitting it. The results speak for themselves. 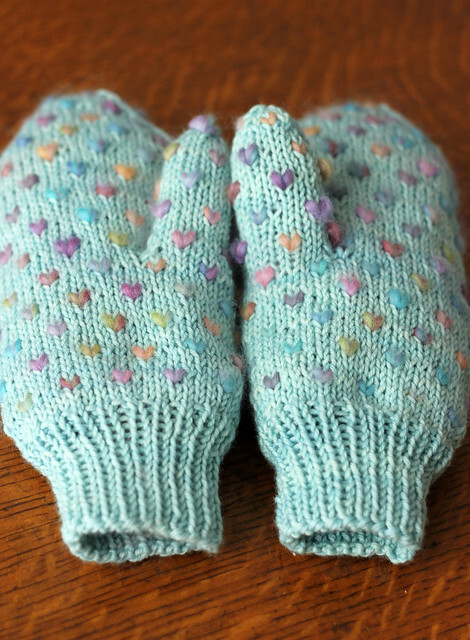 These mitts are so sweet and Lilia loves them! I made a few very minor mods to this pattern, first off I didn't sew down the lining as the pattern suggests. 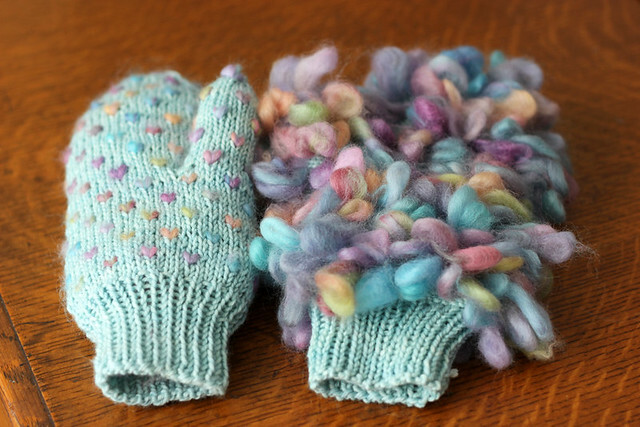 I opted to knit my lining in a bright turquoise shade and really liked the way it was rolling in on itself and added a pop of fun colour to the mitt, so I just let it do it's thing. I also opted to use 3 contrasting colours: Midnight, Grape and Plum on a background of Sand. 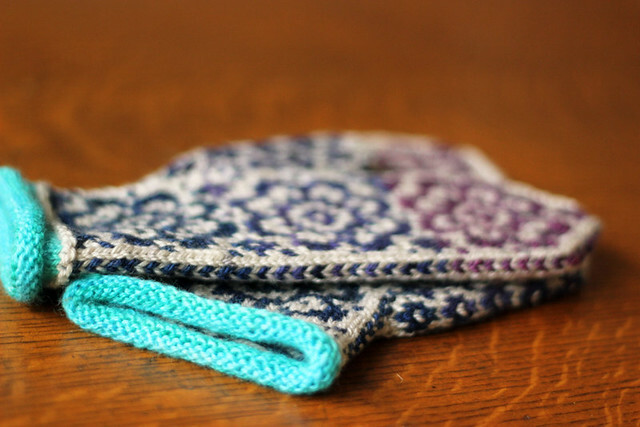 The flower motif on the back of the mitt made it really easy to decide where to switch colours. Happy New Year to everyone! 2013 is shaping up to be a big year for my family. I cannot wait.